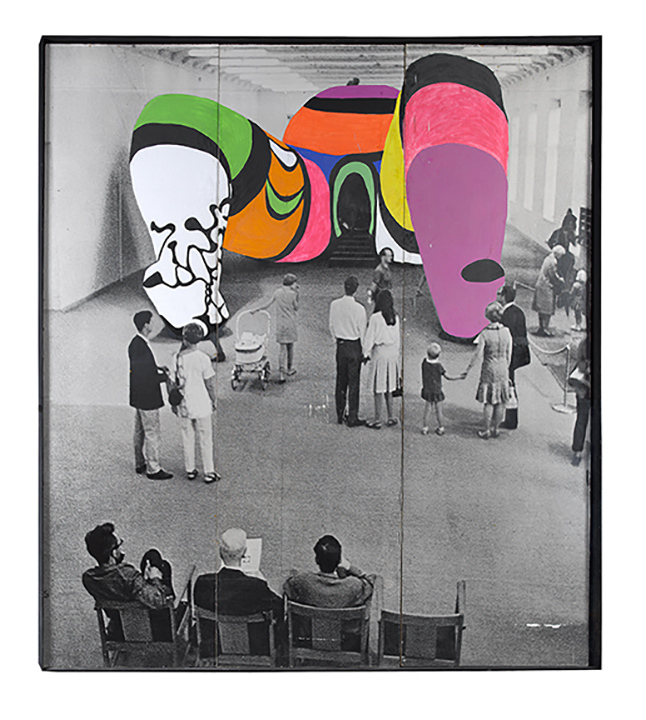 50 years ago, HON, Niki de Saint Phalle’s first accessible sculpture, was inaugurated in Sweden at the Moderna Museet of Stockholm under the watchful eye of Pontus Hulten, director of the museum. 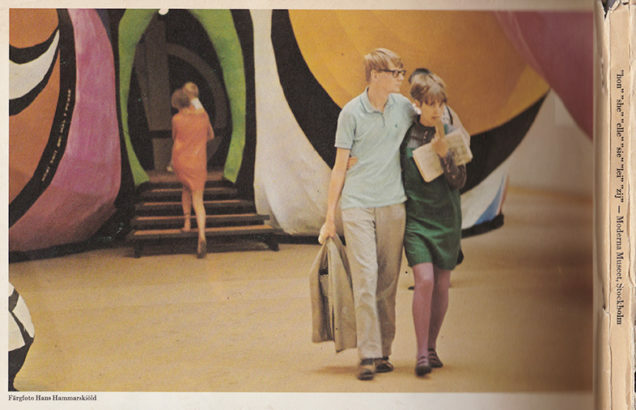 In 1966, Moderna Museet was the most innovative art center in Europe, and very likely in the world. Open from noon to 10 pm, accessible to blue collar workers, with a 27-year old visitor on average, it included a restaurant and a garden where you could drink coffee or beer in between two exhibitions. Back then avant-guard concerts, conference talks or Rauschenberg’s happenings were already part of the programmation like we are used to see today, at high profile cultural institutions. 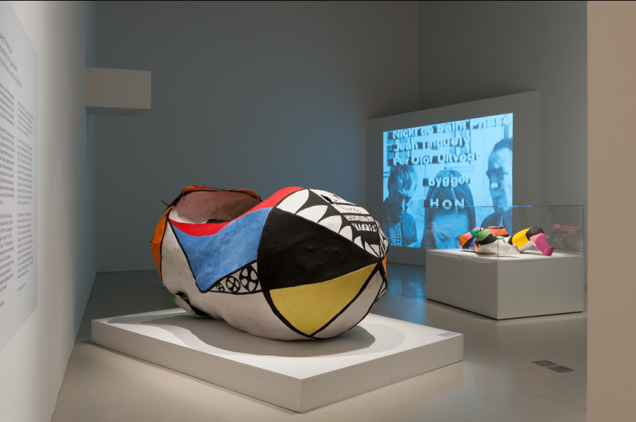 Later the same year, Claes Oldenburg would take over the space for his solo exhibition. In a video interview, Pontus Hulten relates the conception process of HON. With a giggle he says : it was quite an experiment. For almost four years he hoped to organize an exhibition created on-site. Therefore, he spontaneously invited three international artists and friends to create an in-situ installation to be shown over the summer: Niki de Saint Phalle (French), Jean Tinguely (Suisse) and Per Olof Ultvedt (Swedish). 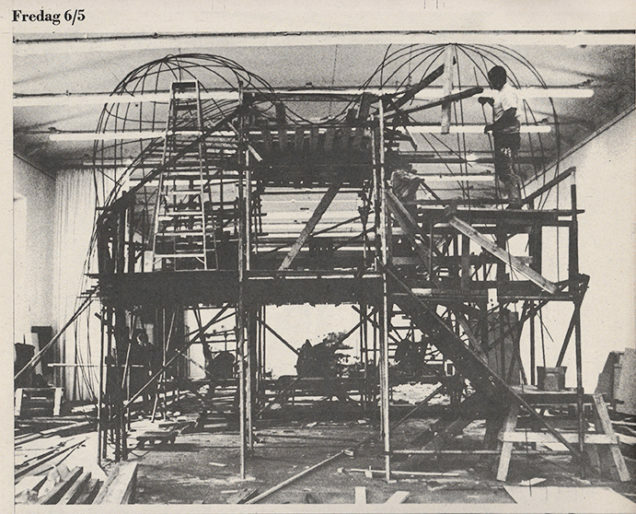 In the same interview, Pet Olof Ultvedt reports: In 1966 we wanted to make big things, build castles and animate them! Niki was fascinated by Facteur Cheval’s castle in France and she wrote a long letter describing what we would do to build a castle inside the museum, full of life and animation. On April 28th of 1966, Saint Phalle and Tinguely arrived in Stockholm. Hulten and Ultvedt went to pick them up at the airport and the discussions about what to do started right away. An Opera? A mechanical theater? A rite of passage made of twelve stations with a religious inspiration? Consensus was nowhere to be found among the crew, and after a day of unproductive discussions, doubt and anxiety crept in. The crew was so discouraged about not finding the right idea, they considered the alternative of giving up and flying to Russia! On the second day, in the car, Hulten threw up the idea of making a giant “nana” similar in type to Niki de Saint Phalle’s earlier ones. All at once they embraced the idea! At the same moment Ultvedt names her: “HON”, SHE in Swedish. Back to the Museum, in an entirely transformed atmosphere, the dimensions of HON were discussed and Tinguely drew up the well-know preliminary outlines of this gigantic project! We got going already the next day and it went very fast. Jean already figured a basic idea about of how to do it… It had to be built with rebar, covered with chicken wire and glued fabric on top, and then painted. That was a major step to know how to proceed… And it went very fast – remembers Pontus Hulten in the same interview. Indeed, it went very fast, the three artists with the help of five assistants worked for 40 days almost day and night to build a 82 feet long, 30 feet wide and 6 tons heavy sculpture! The Iron Age (10 days) when her rebar skeleton was constructed. 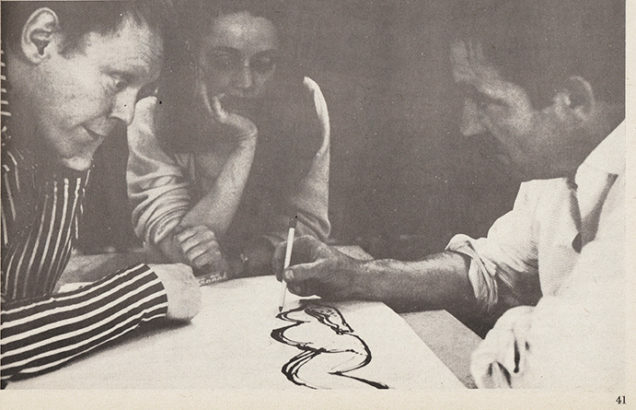 At that moment, Jean Tinguely discovered that a dish-washer in the restaurant of the Museum, is a Swiss art student, Rico Weber, who is hired on the spot. With this a life-long friendship and collaboration started. Then, to mark the beginning of a new period, the team bought new white working clothes and entered the Glue Age (7 days). Carpenter’s glue is boiled for days, all day, 20-30 liters at a time, to fix the fabric sheets on HON’s armature. The odor of the glue made from animals’ bones smelled godawful. The original hands and feet were rejected, they were far too realistic to suit a nana. Look ! And then started the Black Age (9 days), time to paint the outside in bright colors and the inside all in black in stark contrast. Despite some technical difficulties – masses of cracks to repair and repaint in addition to many sleepless nights – they succeeded to transform the HON into a beautiful lady. In the middle of it, on May 21th, Pontus and Jean flew to the Monte-Carlo Rally to escape just for a day. On May 24th, the era of furnishing begun. The list of things which were brought into HON was as long as surprising: a coin telephone, a love-seat sofa, a cinema for twelve people, a bar, a plastic pool, a museum of fake paintings, an automatic sandwiches vendor, two machines of Tinguely, an installation of Per Olof Ultvedt, a slide for children… just to name a few. Photo de la HON repeinte © 2016 NIKI CHARITABLE ART FOUNDATION, All rights reserved. But even if the HON was the talk of the town, very few journalists expressed an artistic opinion.The articles were mostly descriptive. Some of them underlined the poetic allusions made to the organs of the human body. The milk-bar was in one breast, waste was disposed of down a chute into Tinguely’s formidable glass-breaking machine below – the whole thing was felt to allude to the digestive process. A gold-fish pond occupied the site of the womb and this required no commentary. Ultvedt’s heart was not simply a flapping, rocking, pumping shape; but a man could be found in HON’s heart. It is impossible to say if these allusions were intentional. The very fact that it was possible to take practically every shape as a poetic symbol was the best evidence of the idea’s inherent strength. HON transformed a very random idea occurring on the inside into something new, giving it a meaning that it would never have had outside of the sculpture. HON was, therefore, really a “cathedral”, since in a cathedral, the placement of individual parts in a whole creates a transformed concept. 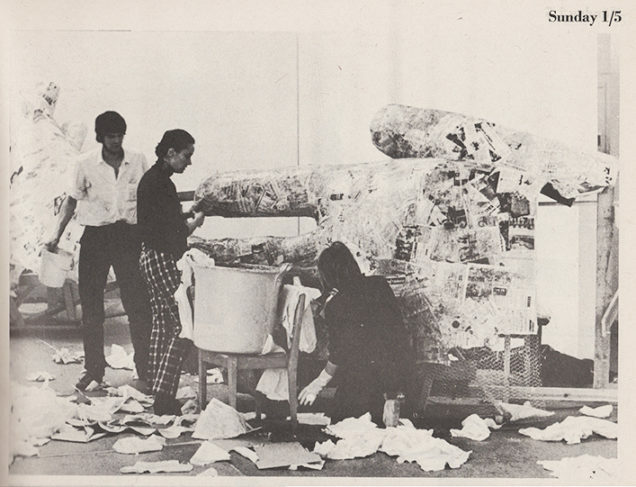 Right after the show, at the end of August 1966, HON was destroyed and only her head was kept, which is still today part of the Moderna Museet’s permanent collection. Other small pieces were glued to the limited edition catalogues and sold. But that’s not it : at a time when the Grand Palais invites an international artist to invest and transfer its giant Nef, Monumenta, into a new and immersive environment, every two years, sometimes with more or less success given the size of the space. When Yayoi Kushama’s Infinity Room is touring around the world. When the Rain Room tickets are sold out months in advance or when Banksy’s Dismaland created a media landslide, we can easily say that 50 years after HON, the public is still craving for immersive and gigantic art projects and rare are the artists who can pull off such an amount of work, even with a crew. Those who experienced Kushama or Kapoor environments know how strong the amazement is and how long it lasts. There are some art installations which live forever in the viewer’s minds. HON was such a great achievement in terms of reflection, courage and team work ! No wonder she was built at the most innovative place of the time and let’s just say we regret not having seen it, too. All images excerpt from “HON: en historia” – catalogue of the exhibition, 1966 – Photos of Hans Hammarskiöld.